A few months ago, I dreamed I could fly. It wasn't one of those typical dreams where one weaves between trees and soars over mountains. I didn't see or feel myself flying. Still, I knew I could fly. It was an intellectual understanding of the fact that I was physically capable of flying. Here's the kicker: I never actually flew in the dream. There were moments where it would've been really cool to fly. I forget the exact details now, but I remember feeling like a sad sack of potatoes for not taking those opportunities to do it. I didn't fly because I was afraid. 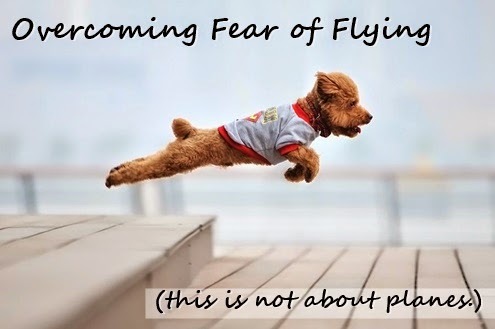 Even though I knew I could fly, I was afraid to do it because I'd never done it before. Also, no one else around me could fly. I worried they would think I was weird. That was also scary. This dream came when I was experiencing more firsts than I'd experienced in a long time and there were even more in the horizon. So many possibilities have been presented to me this year. I've taken some chances that felt precisely like jumping off a cliff. Truth be told, I've also had moments where I did the equivalent of hiding in a cave. I took this dream as a lesson. It was a reminder not to fear my potential. The dream made me wonder what talents I have hidden from myself by trying to stay small to avoid being judged by others. What gifts are buried under self doubt? What incredible feats could I accomplish if I dared to trust my intuition more deeply? What would I be capable of doing if I stopped measuring myself by what I've done in the past and began to measure myself by the potential of my true Buddha nature? I invite you to ask yourself the same questions. Let the answers guide the choices you make today, even if it's just for an hour, and see how you feel. Expect miracles.